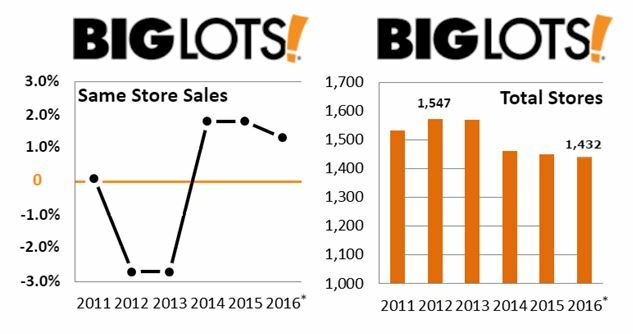 Big Lots is on the upswing. The closure of underperforming stores in recent years has helped boost profitability. And a fresh look at merchandising with a focus on what it describes as “ownable” and “winnable” categories like home and housewares has contributed to two years of increased same-store sales – soon to be three at the end of fiscal 2016. 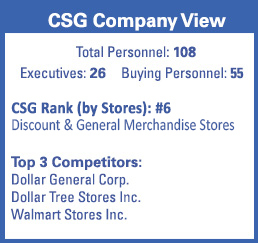 Source: Chain Store Guide’s Database of Discount, Dollar & Specialty Stores and company reports. *CSG projections based on proprietary analysis and company statements. Actual figures are subject to change. This data is not intended for investment decisions.